The exhibit also showcases the careers of other Hall of Fame members like Annika Sorenstam, Nancy Lopez and Babe Zaharias, as well as present-day major champions like Lydia Ko, Stacy Lewis, Inbee Park and Lorena Ochoa. Don’t miss special items like the robe given to Amy Alcott after her ceremonial jump into Poppie’s Pond after winning the 1991 Dinah Shore Championship (a tradition that she actually started in 1988)! The exhibit is a fascinating and inspiring look into the world of women’s professional golf spanning the past eight decades. 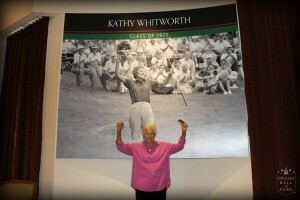 For more information, contact the World Golf Hall of Fame at (904) 940-4000 or visit http://www.worldgolfhalloffame.org/.